Ceramic foams made from a wide range of ceramic materials, both oxide and nonoxide, are being considered for a whole range of potential applications. These include hot gas filters, interpenetrating composites and biomedical applications as well as thermal insulation, kiln furniture and catalyst supports amongst others. Three of these are described briefly below as well as a new processing route based on gel casting. 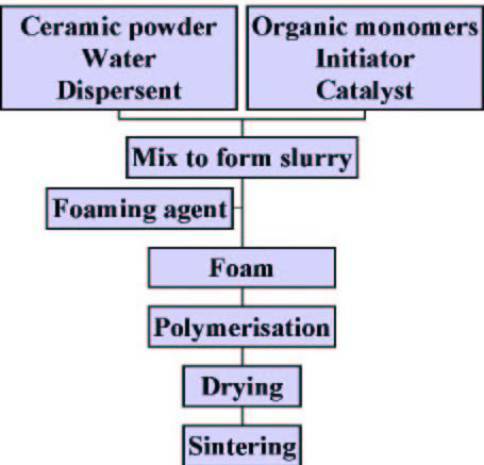 The process for fabricating the ceramic foams, which has now been taken to full commercial status by Hi-Por Ceramics, a new company created specifically for the purpose, is given by the flowchart in figure 1. A stable, well-dispersed, high solids content, aqueous ceramic suspension is prepared which also incorporates an acrylate monomer together with an initiator and catalyst. The latter is used to provide in-situ polymerisation. After the further addition of a foaming agent, a high shear mixer is used to provide simple mechanical agitation that results in the formation of a wet ceramic foam that can be dried and then fired. Figure 1. Process flow chart for production of ceramic foams. One of the advantages of the in-situ polymerisation method is that it is common to observe a period of inactivity between the addition of reagents and the actual beginning of the polymerisation reaction. This is known as the induction period or idle time (ti). The induction period is beneficial since it allows the casting of the fluid foam into a mould prior to polymerisation and control over the pore size. A wide range of ceramic materials have been produced as foams using the new process. Although the majority of work has focused on the engineering ceramic oxides, materials such as alumina, cordierite, mullite and zirconia, a large number of other ceramics can be foamed. These include the bioceramic hydroxyapatite, the electroceramic lead zirconate titanate (PZT), low thermal expansion sodium zirconium phosphate (NZP) and, more recently, non-oxides such as silicon carbide and aluminium nitride. In general, foams in the range 5% to 40% of theoretical density can be produced; a typical micrograph showing the structure can be seen in figure 2. 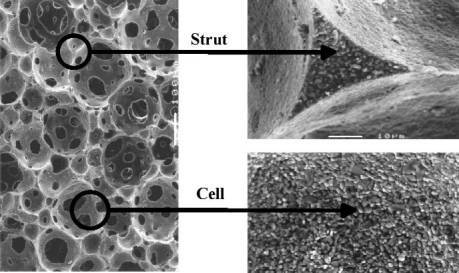 Note how the pore walls and struts are solid and fully dense; this provides high strength and chemical resistance. Figure 2. Typical micrograph of a 30% dense alumina foam. Although the lower the density of the foam the larger the cell or pore size, recent research has allowed a far greater degree of control to be achieved. Foams can now be produced with cells as large as 1 mm and densities as high as 30% of theoretical, whilst 20% dense foams have been produced with cells as small as 20-50 μm. Foams made of the engineering ceramics such as alumina offer comparatively high strengths, up to 80 MPa crush strength and 25 MPa modulus of rupture. Thermal insulation is almost as good as fibre-based products whilst also offering a totally fibre- and dust-free working environment. With zirconia the service temperature can be as high as 2000°C. A wide range of component shapes is also available. The production route itself is intrinsically a casting process and hence tiles, tubes and a range of other custom shapes can all be produced very easily. In addition, both the green and fired foam may be readily machined, drilled, turned and slit opening up the possibility of producing some very complex shapes indeed. In addition, it is a simple process to apply a dense coating to one or more surfaces, either to eliminate permeability or to increase the mechanical properties of the surface layers. One application that could utilise this is the production of ultra-low mass ceramic crucibles. These can significantly reduce the thermal mass to be heated during processing of their contents, thus improving energy efficiency. The diesel particulate filter (DPF) is a device that is designed to remove carbon particulates from the exhaust gases of a diesel engine. There are two primary, though conflicting, factors governing the suitability of a particular filter medium. First, the filtration efficiency has to be high enough to warrant its use but second it has to be porous enough to maintain a low back-pressure on the engine. The new ceramic foams have a structure that makes gas flow through them tortuous, a feature that provides a high filtration efficiency, up to ~90%, whilst the back-pressure is low enough provided the density of the foam is kept low, figure 3. A PhD studentship on the use of these foams for DPFs has almost been completed. It also utilises an innovative technology for destroying the carbon particulates as they are trapped in the structure, resulting in a ‘trapless trap’, i.e. one in which there is no build up of carbon and therefore no need for periodic regeneration cycles. Other hot gas filtration applications have also been envisaged. Figure 3. Backpressures generated by various density foams using Printex U, a commercial flame soot, as a simulant for real soot. Interpenetrating composites are a new kind of composite structure in which there is an interpenetrating matrix of two different phases, in this case ceramic with either metal or polymer. They are also known as 3-3 composites, where the numbers refer to the number of dimensions in which each phase is continuous. It is the open porous structure of the foams that allows them to be infiltrated relatively easily at low pressures with either molten metals such as aluminium or magnesium or any number of polymeric materials via a simple low pressure system. The result may be seen in figure 4, which shows the structure of such a composite produced by infiltrating an alumina ceramic foam with an aluminium alloy. The absence of any porosity is clearly observable, as is the degree of wetting between the two phases. Figure 4. Optical micrograph (×500) of a metal-ceramic interpenetrating composite (MCIC) with approximately 80 vol% LM6 aluminium alloy. Bone substitute and resorbable implants can be produced when hydroxyapatite and other calcium phosphate variants are used as the ceramic phase. These foams have a good ability to sustain and encourage the growth of human cells; pore sizes of 100-200 μm allow osteoblasts to grow over and into the pores, leading to osteoid formation that can mineralise within the pores. Processing conditions that result in the presence of ~1 μm diameter microporosity in the pore walls are important for effective cell attachment and ingrowth and both the microporosity and the macroporosity have been found to affect the cell morphology and degree of cellular infiltration, figure 5. In vitro cytotoxicity tests have revealed that the purity of biomedical-grade hydroxyapatite powder is not compromised by the reagents employed or the process route itself. In all tests so far the HA foam has outperformed competitive materials in terms of cell growth, bio-compatibility and flexibility in application. The controlled interconnected porosity of the HA foam also allows great potential in the development of implants for the slow release of therapeutic agents. One application that Hi-Por are currently pursuing is the use of an HA foam insert into the back of artificial eyes. The porous structure allows muscle to grow into the eye enabling it to move in the same manner as the patient’s original eye. This provides much greater realism and hence a vastly improved aesthetic effect. Hydroxyapatite has also been found to ion exchange with a number of heavy metal ions such as Al, Co, Cr, Fe, Ni and Pb with 100% removal from aqueous solutions being achieved for some ions under the correct conditions. Thus these foams can also be used as filters for contaminated water. Figure 5. 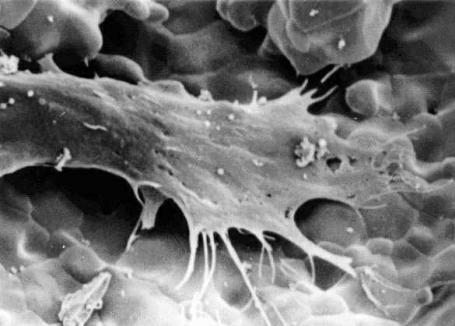 A human long bone cell growing on the surface of a hydroxyapatite ceramic foam. The presence of microporosity allows the cell processes to attach more readily. 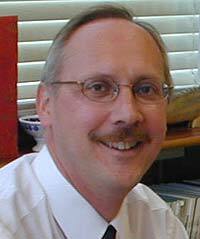 For more information on this source please visit Jon Binner.